Belvoir presents THE GLASS MENAGERIE by Tennessee Williams, in the Upstairs Theatre, Belvoir St Theatre, Surry Hills. 20 September - 2nd November. The Belvoir production of Tennessee William's THE GLASS MENAGERIE, is the third major production of that play that I have seen in the last four years. This production, unusual to the recent Belvoir general aesthetics - has stayed faithfully to the text as written, using even the American dialect. Eamon Flack, an Associate Director of the Belvoir, last year Directed ANGELS IN AMERICA and there, too, respected the writer's work, and the audience's intelligence, to the production's and play's ultimate great acclaim. This, THE GLASS MENAGERIE, is an Australian production of a great American classic, without re-writes (STRANGE INTERLUDE), or edits (DEATH OF A SALESMAN), or dispensing with the period and/or cultural heritage (CAT ON A HOT TIN ROOF, PRIVATE LIVES), of the 1944 original. It is being presented through the wide ranging cultural perspectives of a team of contemporary Australian Artists. For, "Nobody sees anybody truly, but all through the flaws of their own ego." - a quote from Tennessee Williams. In 2010, at the Laura Pels Theater, in New York, the Roundabout Theater Company and the Long Wharf Theater, under the Direction of Gordon Edelstein, gave us a production of THE GLASS MENAGERIE, with an artistic conceit that began with a writer, presumably, Tennessee Williams, later as Tom Wingfield, the narrator of the story, typing the text of the play in a nondescript hotel room, and with the power of his imagination, subsequently, summoning the other characters of the drama, onto the stage and into inter-active action, as he wrote. The play was given within this 'framework' and there were gains and losses to the affect of the play as an experience. The American Repertory Theater presented THE GLASS MENAGERIE in the Booth Theater, Broadway, last year, 2013 (October), with a thoughtful artistic brilliance that shook the conventions of the text, and within the sensibilities of the Director, John Tiffany, and Movement/Choreographer guide, Stephen Hoggett, revealed the play in an entirely new light. What struck me, powerfully, amongst the 'discovery' of the play (almost to see it as if it was a new play), was the period dimensions of the effect of the Great Depression on the personal circumstances on all the characters. This experience, became one of the highlights of my theatre going life. There was a very long program. There was a Garbo picture and a Mickey Mouse and a travelogue and a newsreel and a preview of coming attractions. And there was an organ solo and a collection for the Milk Board - simultaneously - which ended up in a terrible fight between a fat lady and an usher! All in all, I felt that there was sometimes some 'over egging' of the 'prejudices' of these two artists in this production, just as there was a flagrant neglect in the 'egging' at all, in the Simon Stone production of CAT ON A HOT TIN ROOF. In truth, then, which side of 'egging' you might prefer, will, I guess, always be a personal choice. Again, as Tennessee said: "Nobody sees anybody [anything] truly, but all through the flaws of their own ego." In this production, Mr Mullins, as a contemporary actor with the responsibility of the playing of Tom Wingfield, in 2014, employs contemporary video equipment to assist his clarification of his version of Mr Williams', Tom's, story in THE GLASS MENAGERIE. Mr Mullins, as a stage manager to the setting of the storytelling, claims the story as part of his own as well, it seems. The use of the live video equipment by Mr Mullins, the cuing and the inclusion of pre-filmed sequences (Sean Bacon) that are screened and orchestrated by Mr Mullins, re-creating, lovingly, the magic of the look of the cinema of the period, with some of the original titles -legends - images, indicated in the text, connected me back to Mr Mullins' 'inspired' performance in the Sisters Grimm, LITTLE MERCY, and to his 'gay'-sensibility demonstrated there in his glorying in vintage film and performance (even more obvious in Sisters Grimm present production at the Sydney Theatre Company (STC): CALPURNIA DESCENDING, I'm told, where the second half of that play is the adoring enactment of vintage films! created by them, as is Mr Mullins/Tom's, here.) It represents, as it was for Tom - a kind of necessity to go to the movies - as a gay trait, a signal of a sensibility - the alternate fantasy world of the silver screen and the screen's icons, a safe place to 'be' in. There is great intellectual rigour in the work of Mr Mullins in this production, but it was, in my estimation, appreciation, not only sometimes a virtue, but also, sometimes a vice, for in his pleasure in the rigour of every detail of the work, there was a tendency to idiosyncratic vocal mannerisms, and self-conscious character physical gesture (that hand plumping of his hair!) that held one back from believing that what was happening had any real spontaneity - it appeared 'studied', over 'stage-managed', 'actorly'. This is true of Mr Mullins, I believe, when he is not tightly directed, in my admiration of his very full opportunities on the Sydney stages of Belvoir and the STC, where his intellectual care is too obvious in the choices he gives us - which he 'indicates' for us. 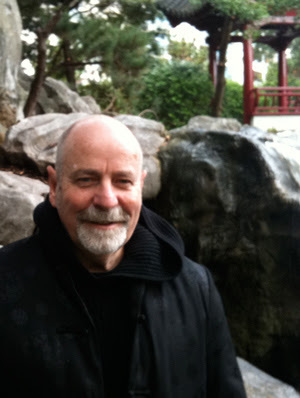 In ANGELS IN AMERICA, for instance, there was in Mr Mullins' work in MILLENNIUM APPROACHES, a too careful approach, exhaustingly studied and 'presented', whereas in the necessary physical chaos of the action of PERESTROIKA , the second play - the wrestling with the Angel, for instance where there was no time for carefulness - spontaneous truths erupted. Too, in his passionate work in SMALL AND TIRED last year in Downstairs Belvoir, a 'blazing' of openness, an appearance of spontaneity, not deliberation was amplified. There is at the heart of this performance an unfortunate 'preciousness' that prevents it from entirely capturing one. Comparisons are odious, but the work of Zachary Quinto as Tom, last year on Broadway, remained indelible, in all ways, for me. More than shades of that, to come, in the 1958 Williams' play, SUDDENLY LAST SUMMER. I was reminded of the Frances Farmer bio-pic, FRANCES (1982), Directed by Graeme Clifford, starring Jessica Lange, Kim Stanley and Sam Shepard, featuring a similar operation - there is some question, whether, in the case of Ms Farmer, if it was a truth or falsity. It was, however, a medical instrument, used often, in mental hospitals, to control behaviour, in this period of time. Ms Riley's feisty, and grounded performance gives a powerful resonance to what sometimes can be a sentimental imagery and conclusion to this play. Pamela Rabe, anything but Mr William's "little woman", tackles the challenge of Amanda Wingfield with an immersion, faithfulness, to the guidance of Mr Williams that is a subduing of her usual temptation to appear to be playing a game of pretend with her audience. I have, sometimes felt, that Ms Rabe tends to reveal the actor behind the 'mask' of her characters, looking for a kind of recognition, approval, from her audience, but here, Ms Rabe has buried herself, deeply, there is a palpably real woman struggling with the break-up of her family in straitened times, desperately trying to find a solution for the future, especially for her daughter, Laura. It has what Mr Williams asks for in his notes "... an endurance and a kind of heroism, and though her foolishness makes her unwittingly cruel at times, there is a tenderness ... " Ms Rabe, the actor, does not make an entrance - perhaps, just a peep with that sweeping centre entrance stage claim (very old school, really! ), and when Amanda appears in that "girlish frock", twirling around, a twirl or two, too many?! I don't believe I have seen a better performance from Ms Rabe, than this one, in this production. Mr Greenwood's Jim is gauche and sentimental and seemed to lack that zipp, for the promises of that future. A proffered future, that Mr Williams gives us a glimpse of in the writing, that is different to the Wingfield family's future. For sure. The Design concept of the material house-apartment that the Wingfield family rent in St Louis, by Michael Hankin, is an architectural creation of solid clapboard walls and expansive windows - just on what middle American roof top building, the source imagery is drawn from, upon, was a kind of mystery posed to me, that kept me pondering during the performance. It has, as well, a kind of solid reality that seemed opposite to the memory metaphor of the Williams play. I was drawn to ponder, particularly, since, I suppose, the 'accuracy' of this architectural design precluded my ability to see all of the stage. Up there, seated in H29, the interior of the kitchen was masked out - I could not see most of the activity. Amanda's first big speech was delivered there to her family - all invisible to my eye. It seemed, to me, that unless you were seated in the central block of the theatre or in the inner flanks of the side seats, you had an impeded sight line for some of the acting, action, of the Directed play. The tongue of the floor plan brought the living room unimpeded to us, thank God. It seems that Mr Flack seems to have being happy with that 'punishment', crippling' of some of his audience. Up to a third, even 40%, perhaps. The Artistic management seemed to have been happy with that as well - they sold the restricted view for the same price as the complete view - therefore, no money lost! I was not happy with that, for sure. Others sitting near me were not happy with that. Is it not a part of theatrical design to ensure that the audience can see the action of the staging of the play? Would it not be a Design 101 consideration that has as many of the audience as possible ought to be able to see the perfroemnace without restricted eyeline? A prerogative in the design plan, shouldn't it be? We are giving this play for an audience aren't we? A paying audience? Those of us, the paying audience, that assist the cash flow for Belvoir, out of our hard-earned pay, to pay their artists and administration, should be able to see the performance, wouldn't you think? There is, of course, a design precedent, at Belvoir: the Design that the Artistic Director, Ralph Myers, created with, and for Benedict Andrews, and their production of THE SEAGULL. I feel, this choice is a kind of act of arrogance aimed at the audience, that does not create a sympathetic environment for the production of the play - it creates, rather, irritation.Those poor actors have to really work hard to win us, and that we can't see them in the theatre live, and, yet, that they do manage that, is a Herculean wonder that should not be forgotten! Some might then suggest that the live video that is projected onto the two side screens is a satisfactory compensation for those of us in the side seats. Well, they might be if I had come to see a film. And they could be, if the live video images matched the sound of the spoken words. One heard the live text from the actors and watched the delayed imagery on the screen. There was/is some seconds delay. We hear the live text, and watch seconds after, the moving of the lips to stillness, it is like watching an out-of-sync movie - it was very boring, irritating and discombobulating. A little of it may have been acceptable, but in our 'crippled', restricted viewing seats, there was a lot of it. Too much of it. However magical the imagery, and some of it is beautifully nostalgic, the telling of the live story was impeded, and the experiencing of it in the production, distracting. THE GLASS MENAGERIE proves to be a stellar text to survive such discourtesy. When the video techniques improve, employ them, perhaps. But as they are still in a technological developmental stage, don't engage at this level of attempted artistry in the theatre, please. I notice that none of the major reviewers mentioned these Design flaws, and so I assume the publicity arm of the Belvoir company had insured that they sat centre block - as I understand the sub-scribers were accommodated with an offer to change the seats. It shouldn't just be us other paying patrons that ought to be recording unsatisfactory experiences for history's sake, I reckon. Grrrh! The other Design elements are generally pleasing. The Costumes by Mel Page, are well done, although Amanda's general clothing seems to be of a different period and awkwardly cumbersome, and Laura's Scene Seven dress, a little over dressed - particularly with such short notice of preparation given Amanda. The Lighting Design by Damien Cooper solves the balance that allows for the screen images with the set lighting - it justifies the number of windows in this strange period apartment. Stefan Gregory, as Composer becomes a little to florid with the soundtrack string orchestration to the scenes, a definite B-movie sound sometimes! 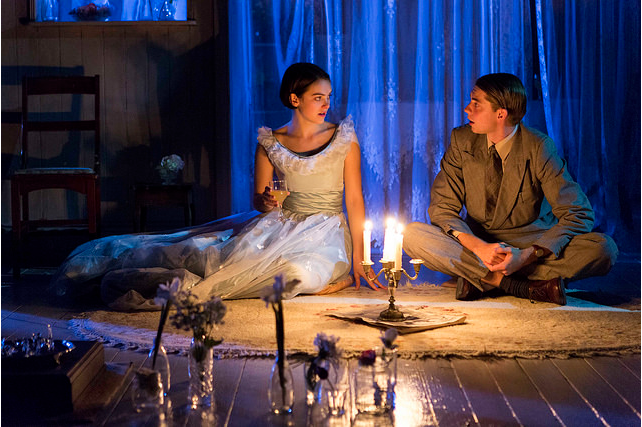 THE GLASS MENAGERIE at Belvoir, then, worth a visit, even with its controversies of design and artistic emphasis. As Laurette Taylor, the originator of the role of Amanda wrote to her son: "The play and that remarkable fellow Tennessee Williams have come under the wire (...) - The Play's the Thing." (1) It is, indeed. TENNESSEE WILLIAMS. Mad pilgrimage of the Flesh by John Lahr. Bloomsbury Circus - 2014. The Glass Menagerie by Tennessee Williams. Penguin Books. Modern Classics - 1945 - 1973. Belvoir Program for The Glass Menagerie - 2014. TOM, The Unknown Tennessee Williams by Lyle Leverich. Sceptre - 1995. The World of Tennessee Williams, edited by Richard F. Leavitt. G.P. Putnam's Sons, New York - 1978.